In the nineteenth century when concerts were longer and more miscellaneous, short concertante works such as these were very welcome. As concert-giving has changed, audiences tend to want, and impresarios to mount, full three movement concertos, and these once popular short works have dropped out of the repertoire. They got a new lease of life with vinyl discs, where they made useful fillers, but since you can get both Chopin concertos onto a single CD, they have tended to drop out again. 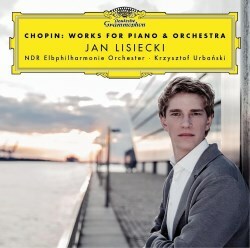 So the arrival of a disc of all four of Chopin’s works in this form from Jan Lisiecki, who has already won golden opinions for his Chopin concertos and studies, is very welcome. All four come very early in Chopin’s career, and the earliest of them, the Variations on ‘Là ci darem la mano’, were composed while he was still a student in Warsaw. The others were all written before he moved to Paris and concentrated on writing for solo piano. They are all written to show off his virtuosity, which was not of the Lisztian barn-storming kind but nevertheless dazzling with pearly runs and fast fingerwork. There is also some dreamy poetic writing. The orchestra nearly always simply supports the piano: there is very little of interest in their part. While none of the pieces is a great work they are all very enjoyable and those who enjoy the concertos will enjoy these works too. There are constant hints of the later and greater Chopin. The Variations show, as Gerald Abraham suggested, Chopin’s delight in his own skill, more than a desire to impress, though there is some of that too. After an introduction the Mozart theme is stated and followed with five variations and a coda. These concentrate on ornamenting the tune in different ways’; there is nothing like the probing of Liszt’s Don Juan Fantasy. The Fantasy on Polish Airs is basically a sequence of three folk tunes, increasingly decorated, of which the third, the kujawiak, a kind of mazurka, is the liveliest. The Krakowiak is a splendidly vigorous dance with syncopations and accents and also with a rather more interesting orchestral part than usual; there are even some wind solos. The latest of these pieces shows which way Chopin was heading: the Andante spianato (‘spianato’ means ‘smooth’) is unaccompanied and very like a nocturne, while the Grande Polonaise is another brilliant display piece. At the end Lisiecki gives us an encore, the posthumous C sharp minor nocturne which Chopin wrote at the age of twenty but did not publish. Everything in such works depends on the soloist and Lisiecki rises to the challenge. His playing is full of imagination, poetic in the dreamy passages and with wit and caprice in the fast and brilliant ones. He is always elegant, with immaculate passagework which flows like oil and is brilliant without that steely hardness which can affect superb technicians. He is always willing to play quietly. His tone is never forced and his pedalling is light. He cannot make these early works great music but he does make them very attractive. He reminds me at times of the young Pollini’s recording of the E minor concerto. Kryzysztof Urbański does what he can with the orchestral part. The recording places the piano rather more forward than one would want with, say, a Mozart concerto, but in these works that is reasonable. The sleeve note tells us something about Lisiecki but very little about the works. There have not been many recent recordings of all these works together. Garrick Ohlsson’s is immured in his complete Chopin set and several others are only available with the two concertos, which you may well already have and not want to duplicate. I have enjoyed Karl-Andreas Kolly’s version on Novalis but it seems plain compared to Lisiecki. Strongly recommended.